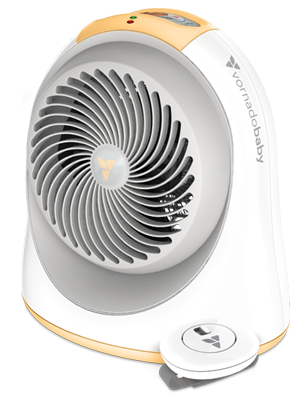 Due to broken motor mounts in transit to retailers & consumers that can allow the heating element to contact interior materials, Vornado is voluntarily recalling the Vornadobaby Sunny CS (Cribside Sensor) Nursery Heater built in the 2017 production season and sold from October 2017 through December 2017. If broken, the heater can overheat and cause the units to melt, catch fire and ignite nearby items, posing a fire and burn hazard to consumers. Vornado has received 5 reports of units overheating, melting or catching fire. There have been no claims of personal injury or property damage. The safety of our customers is our absolute priority. Turn off your Sunny CS Nursery Heater and unplug the heater. 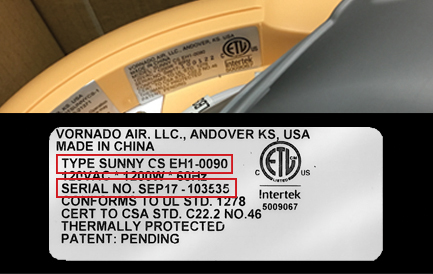 On the bottom of your Sunny CS Nursery Heater you will see a silver sticker. On that sticker is an 11 digit serial number – formatted as you see below and in the image to the right. Disabling your heater is mandatory to receive your free replacement. It allows us to verify that the heater cannot be accidentally used or resold, and allows us to ship your replacement as quickly as possible. Ensure your heater is unplugged and carefully cut the cord about 2 inches from where it enters the rear of the heater. 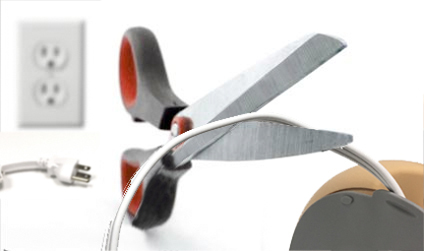 Retain the cut cord and heater for use in the replacement process, detailed below. IMPORTANT: Do not discard your disabled heater until you have received confirmation of your replacement shipment from Vornado. Our goal is to make the verification and replacement process as quick, simple and satisfying as possible. We have several methods to fit our customer’s needs. Select your Country and then choose one of the options below, or call us at 1-844-205-7978 to get help from Vornado Consumer Service.